Andy Rubin’s ambitious Essential Products startup has been essentially inactive for over a year now, merely promising (and delivering) robust software support for its rookie smartphone effort, which never found the mainstream success envisioned by its creator. 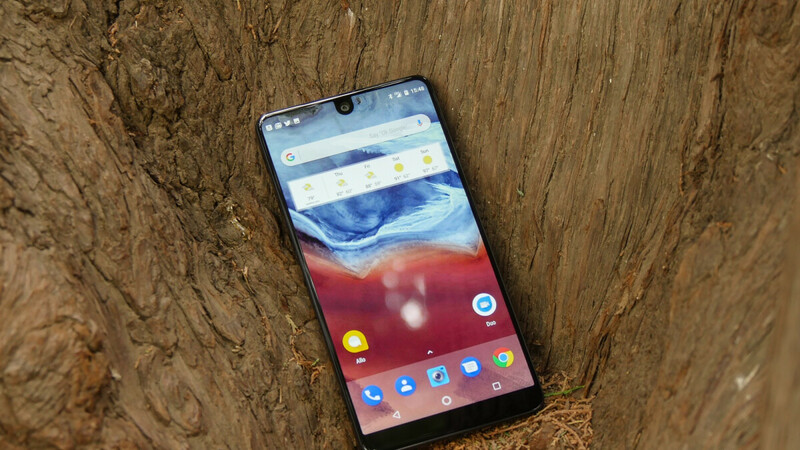 As a consequence, the ex-Googler and Android co-founding father reportedly canceled Essential Phone 2 development, going so far as to consider selling the company he established back in 2015. At the same time, Rubin continued dreaming of a mysterious “game-changing” product that could eventually materialize as an entirely “new kind of phone.” This would have a smaller than standard screen, according to “people familiar with the plans” quoted by Bloomberg’s very well-connected Mark Gurman, relying mainly on voice commands for a type of user interaction only possible in sci-fi movies prior to this product’s development. As far-fetched and scary as it might sound, this mobile device is intended as a “virtual version of you”, booking appointments, as well as answering to emails and text messages by itself in lieu of the human being owning the gadget. If you think about it, that does sound like a logical evolution for today’s slowly improving artificial intelligence technology, although we always expected this next step to require years and years of behind-the-scenes work. Instead, Essential reportedly feels confident a first prototype of this super-advanced AI phone will be finished by the end of the year, possibly eyeing a demo behind closed doors at the Consumer Electronics Show in Las Vegas in January 2019. That’s... pretty early, although the company is likely to wait at least a few more months before showcasing this thing to the public. Interestingly, the end goal could be marketing this device as a “complement” to people’s smartphones rather than a replacement for today’s ultra-high-end iPhones and Samsung Galaxies. But in order for that to work, the price would also need to be low, which sounds unlikely. After all, both the Essential Phone 2 and Essential Home projects were apparently abandoned to focus on this revolutionary concept. Taking the control from the user is a bad-bad idea. I'm OK with the work of a phone-assistant, because I know his tasks, I know I can control (as in "be in charge when needed") the tasks, they are defined, I can change them, I'm not OK with a phone-partner which I must understand, teach stuff, wonder if he got the task right. As long as they learned from the release of the Essential Phone, they will stand to make a solid product. Hopefully they leaned some good lessons from the botched Essential Phone. That thing was DOA. This sounds interesting, so I'll definitely have my eyes open for it. DoA like the KeyTWO? That's definitely going to be a very low seller due to poor decisions from blackberry. BlackBerry doesn’t make decisions on smartphone hardware. However, it will no doubt outsell a second generation Essential Phone, just like the KEYᵒⁿᵉ outsold the first Essential Phone, lol. I know all of this is still a hard pill for you to swallow, but try washing it down with your favorite beverage, and stop getting so offended over my comments. You take this way too seriously. Relax and get over it. I'm not the one who continues to dismiss people's opinions on Nokia articles and get called out in the process. You're just mad because the Essential phone will long still be supported in 6 months while the KeyTWO will be forgotten about by then. I'm not the one that contained to troll BlackBerry, Nokia, and Huawei articles all while trying to force your opinions on others and get called out in the process for it, you are. You're just msd that BlackBerry is still in business and has licensees making their smartphones now, while Essential is on its last leg and will soon be relegated to the dustbin of smartphone history. Oh but you continued to attack people's opinions and comments in those articles doing that very thing you're accusing me of doing. I'm not "msd" at all despite what you want to believe. They're still in business, but they have been resorted to patent trolling just to get revenue. My comment "contained" the truth. Oh, but you continue to troll Nokia and BlackBerry articles, just like you are doing on the latest one, and just like you’re doing here by bringing them up in an article that has nothing to do with them. You’re not just mad, you’re seething with anger because you wanted them dead by now, as you’ve said numerous times in tour now banned accounts, but they are still here. You’ve even taken your ridiculous feud against BlackBerry so far that you’re desperately posting conjecture about patent trolling, with zero evidence from a court of law. Your comment has only “contained” lies. So me saying that Nokia should release phones in the US is also considered trolling according to you? Lol, that user who put you in your place was right. You are a fanboy who attacks any opinions that are opposite of your own. You also hide behind your faux accounts that you are using right now in a recent article. I have posted multiple links to other sites that talk about Blackberry becoming patent trolls. So me saying the facts that the Essential Phone was DOA has you so triggered that you have to troll BlackBerry in an article that they aren’t even mentioned in? Lol, Crispin and MDCHO (among others, including myself) that continually put you in your place are right. You are a troll that attacks anyone’s opinion that are opposite your own, as well as the fact that you constantly troll OEM’s that I favor. You have hid behind 9 faux accounts now, with most of them banned because of me pointing out your incessant trolling. This is your 10th troll account, mxyzptlk. The opinion pieces that you posted have no credible sources from a court of law backing them up, while I have posted links of many documented issue that the Essential Phone has had and is still having. So I post facts, but it's considered trolling? Lol, you have ridiculous double standards. You have never put in me in my place, ever. Not you or your other alias that likes to regurgitate the same bs conjecture. You still believe that I'm someone else despite the fact that I have repeatedly told you that I'm not. You are the one who has the multiple accounts that you like to use to thumb up your own comments. Are you going to use jplightning next? You can deny it all you want, but the fact still remains that blackberry is a patent troll. So I post facts about Essential and Google having what are essentially phones with beta software on it, and that's trolling? Pot, meet Kettle. Your double standards are as ridiculous as you say mine are. I've been putting you in your place since your first account, and you're now on #10, mxyzptlk. You should be ashamed of yourself for having so many accounts here that have gotten banned because of me. You've even resorted to projecting your faux account ways onto me to deflect from the fact that you're on your 10th account now. You post conjecture and BS all day long, and troll OEM's you don't like, and that's why your accounts have been banned. EVERYONE here knows that you're mxyzptlk, so denying it like the coward you are isn't going to work. What new account name will you come up with for your inevitable account #11? Carnage? You can deny it all you want, but the fact is that you're a multi account troll, and you're proving it by bringing up BlackBerry with BS conjecture in an article that has nothing to do with them. You're just seething with anger because Essential is on its last leg and headed out of business. Everyone is wrong except meanestgenius according to him. Lol and you talk about me? You are the one who continues to pick a fight with me since day one when I first started coming here almost a year ago. You continue to project your own conjecture onto me even though you are the one who has multiple accounts. You have multiple accounts that you use to thumb yourself up on multiple occasions. Spare me the bs because you are the guilty one, or should I say geek(y) one? Lol, once again, you’re referring to yourself and your megalomaniacal ways. You are the one that picked a fight with here, just like you continue to pick fights with me and take cheap potshots at me all of the time. You even admitted to attacking OEM’s that I favor with your first account, your mxyzptlk account. You’ve been here since you opened your mxyzptlk account in 2012. You continue to deny it, even though you know that no one believes you and everyone knows who you really are. That’s evident by more and more people calling you out about it, lol. All of your multiple accounts have gotten banned because of me (except your mxyzptlk one, which I made you deactivate), but you continually try in vain to project your faux account ways on me in an effort to deflect from the fact that you are the multiple banned account user mxyzptlk. You may now continue to spew your BS and conjecture and try to deflect from the fact that you’re as guilty as someone holding a just-fired gun over a dead body with a bullet in it that matches the ones in the gun itself. this is good news that they aren't dead. i love essential phone and the whole idea behind the company to begin with. can't wait to see what happens with this. They should release a newer phone with the same design but with a stretched 19:9 display and minimize the bottom bezel. The could also scrap the rear fingerprint scanner for one underneath the display.